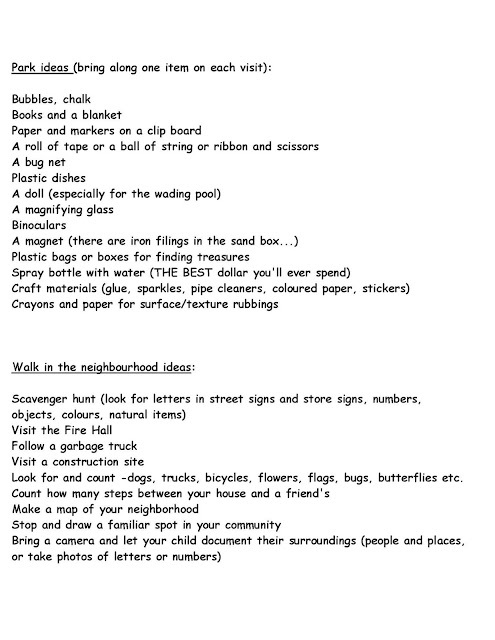 Labels: activities , summer bucket list , where can we go this summer? 1. 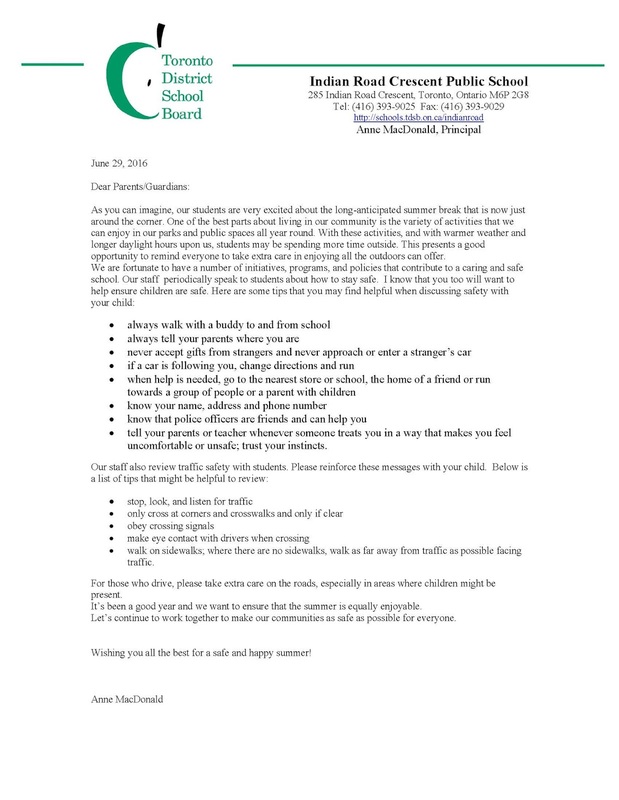 Safety in the community: Please see the attached letter with safety reminders for the summer. 4. 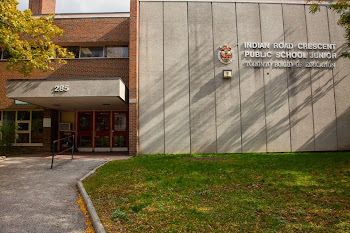 Save the Date: Our first Parent Council meeting of the 2016-17 school year will be on Tuesday, September 20, 2016. Please get involved- come out to our first meeting, where elections will be held for executive positions! Today is a PA Day. Tomorrow is the Canada Day holiday. 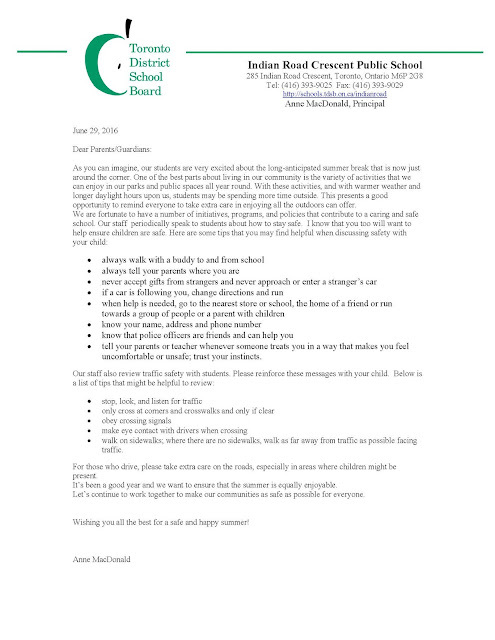 On behalf of the IRC staff, I wish you all the best for a wonderful summer. 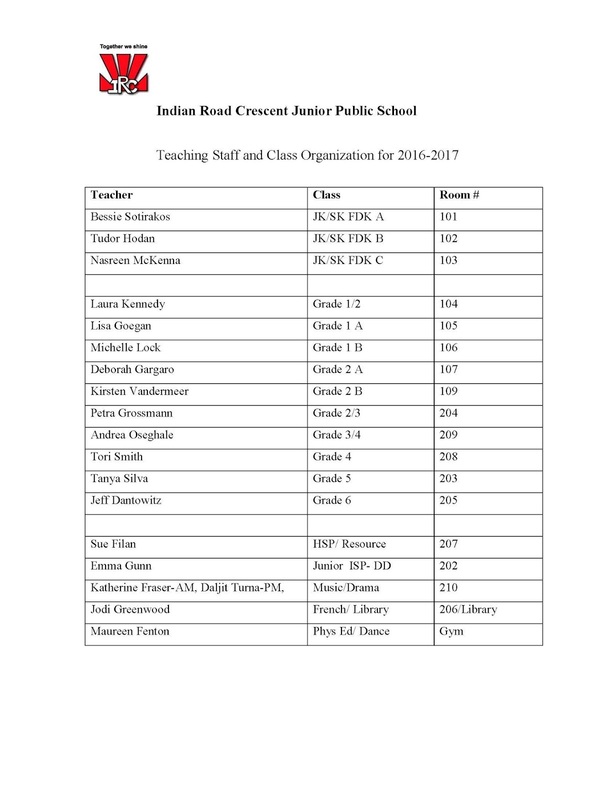 Thank you to this fabulous community for another great year at IRC! Good luck to our grade 6 graduates and all the families who are moving on. We will miss you and hope you come back to visit! Some of you may know that the IRC Parent and Family Literacy Centre (PFLC) is moving to room 108 next year. Well we are in need of a little assistance. We are developing an exciting outdoor play space at the school for next year and need some heavy lifting done. There is a giant tree slice that needs to be moved into the space from the Ossington/Dundas area. We are in need of a pickup truck and some muscle to move the wood. I think the truck will need to have a ramp. If anyone is able and interested, please let Parent Worker, Lesley Aitken know or leave a message in the office before the end of school. 1. Let’s Go Blue Jays! IRC staff and students in grades 3-6 attended the Blue Jay Game yesterday and cheered our team onto a big win! A big thank you to Ms. Fenton and Ms.Hagen for organizing this school trip and for all the staff and parent volunteers who attended! It was such a success that we hope to make this an annual IRC event! 2. 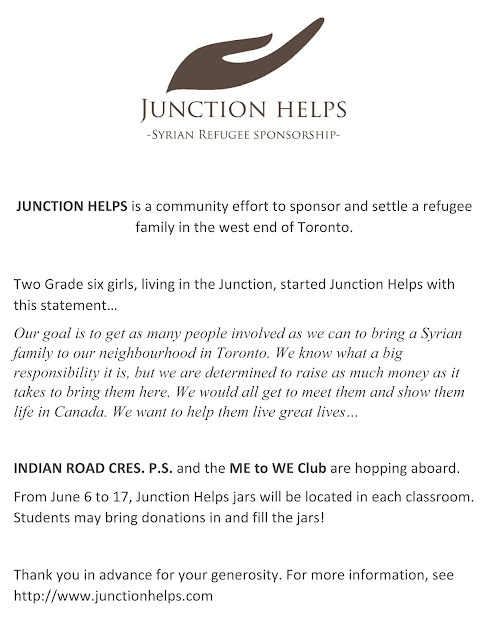 Me to We Fundraiser: Our Me to We group is raising funds to support a Syrian family. Thank you to the community for your generous donations so far. A reminder that donations will be collected in IRC classrooms until Friday June 17th. 3. IRC Book Fair: The Book Fair continues this week and the library is open for business each day before school and after school. Please see the attached flyer for more information. 4. Welcome to Kindergarten: We will welcome our 50+ new Junior Kindergarten students to IRC tomorrow evening, beginning at 6:30 p.m. in the school gym. 5. IRC Playday: Our Grade 1-6 Playday will take place on Wed. June 22nd, beginning at 1:00 p.m. Please see the attached flyer for more information about this year-end event. 6. 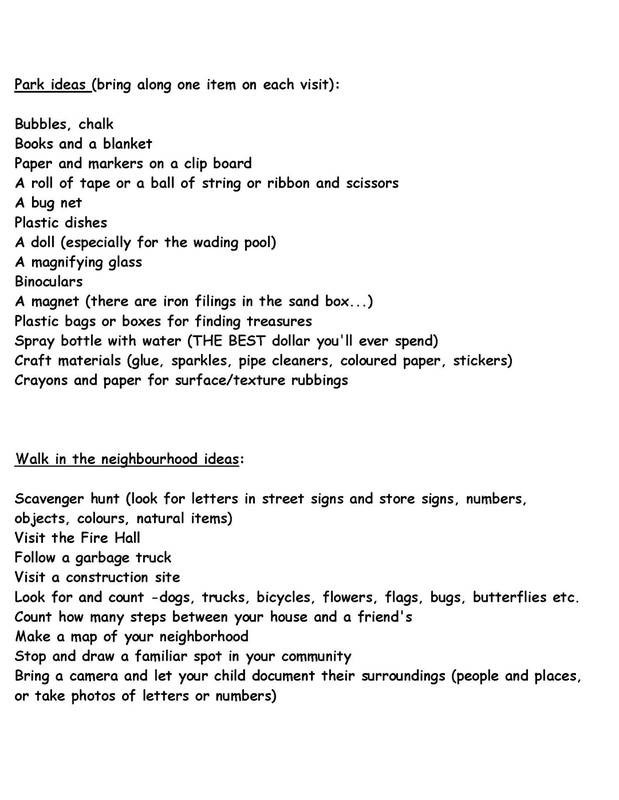 Annette Public Library Contest: Attached is a flyer for an exciting contest open to students 12 years of age and under. (Register for the Summer Reading Club at any branch of Toronto Public Library IN PERSON on SATURDAY JUNE 25th to qualify to win Blue Jays tickets). Welcome to Annette Grade 7s! THANK YOU TO ALL OUR VOLUNTEERS & SPONSORS!!! 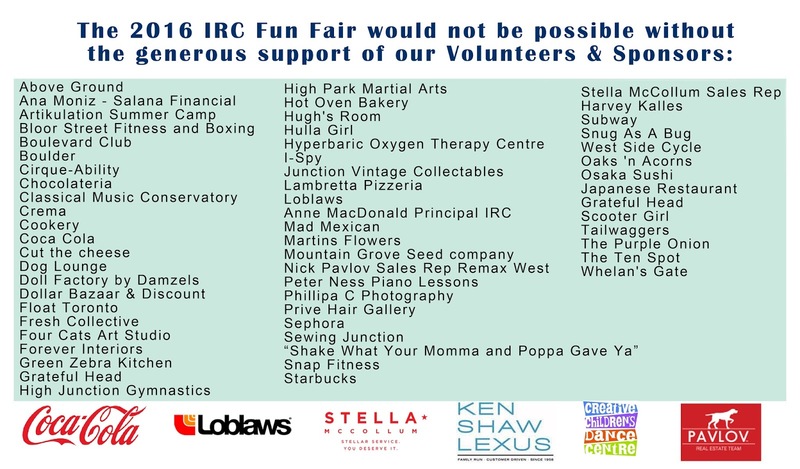 On behalf of the Parent Council and Fun Fair Committee, we would like to send a "BIG Thank you" to all of the Volunteers & Sponsors who made the IRC Fun Fair 2016 a huge success! It would not have been possible without the effort and enthusiasm of so many. Thank you to all the talented bakers who so generously donated to the Fun Fair bake sale! Your goodies were not only delicious but also creative. It was a wildly successful sale and the tables were basically sold out by day's end! We will do our best to return labelled containers to to the correct room if that was included in the labels, but if not and you would still like to retrieve it, please head to the school kitchen where you dropped off your goodies. Thank you, thank you, thank you again! We could not have done it without all your help! Hello bakers! 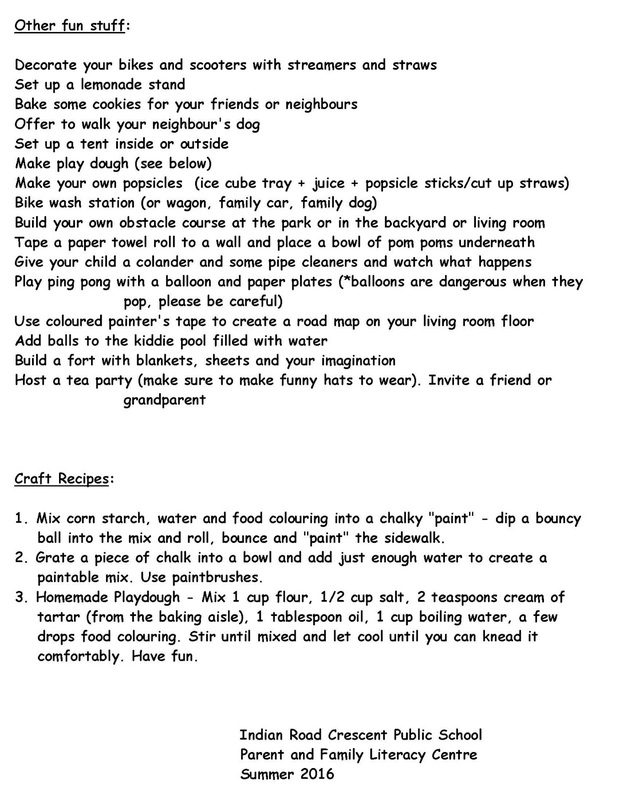 Just a reminder that all nut free baked goods for the Fun Fair should be brought into the school kitchen no later than Friday June 3rd, or passed onto Serena Tso (aka Maddy and Julian Murdoch's mom). Packaged nut free treats (ie. 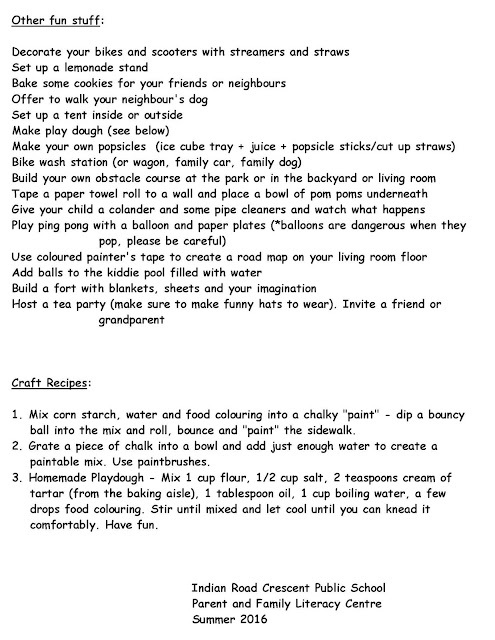 gummies, lollipops, chips etc) will also be appreciated if time is limited for baking. Once again, the Fun Fair Committee thanks you in advance for all your help! 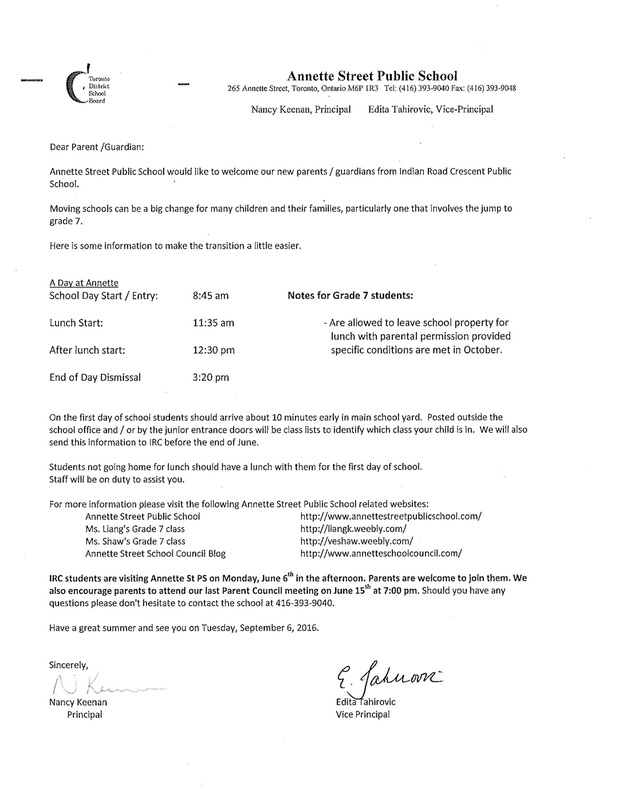 Hello Parents, students and Guest of IRC! The following are just some items that will be available for our Silent Auction this Saturday June 4th! !